Blistering.com: When you first heard the songs Trey [Azagthoth, guitars] presented that were more industrial-based, what was your reaction? Vincent: As a point of clarity, a lot of the more “electronic” styles are very mechanical, which is to say that a number of these songs don’t have drummers. They’re machines or computers; they’re programmed in so many words. None of this is programmed; Tim played every bit of it, with the exception of the intro. That’s an important point of order when people say that it’s “techno” or “industrial.” The decision to put a couple of different drum sounds on the record versus becoming the other thing, was that we added a bunch of different sounds to Tim’s drum set and defined those sounds, like a distorted kick drum or distorted sound. We wanted to add some different spices to a particular track. It’s much like when we added keyboards to some of the tracks on the previous records. What does the song want? Let’s let the song sound like it wants to sound. Blistering.com: I know you’re doing the remix for “Destructos Vs. the Earth Attack,” which should be interesting to hear. Vincent: That’s the b-side to the single for “Nevermore” and it was done by Combichrist. It’s a cool flavor. Instead of building walls, we like to tear walls down. 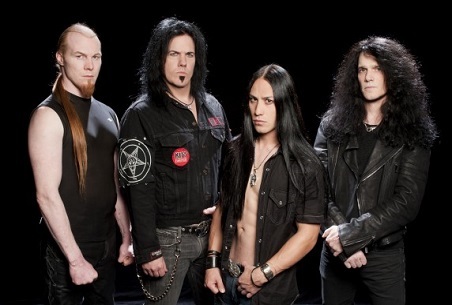 For better or worse, that’s an integral part of Morbid Angel and has been since the very beginning. Blistering.com: I know you like the word “extreme” and don’t like the band being called death metal. Are you comfortable with being labeled “death metal” in 2011? Vincent: [pauses] When we started playing in the 80’s, there weren’t contemporaries for us to look to. Think of what there was for us to listen to – I think the bands that were coming up the same time as us were [Death’s] Chuck Schuldiner [who] was doing his thing. When we first were getting started, it was Chuck, which was very underground at that point with the tape trading. Obviously, there was Slayer, Exodus, Possessed and not this whole host of so many bands there are today with so many different stripes. There’s a lot of death metal with so many descriptor words that are used to try to pigeonhole a given thing. It all sounds like rules to me and rules are made to be broken. Vincent: We have added a few more in Europe. I’d like to do a lot of stuff, but mind you, there’s a number of these festival shows in Europe and unless we’re the headliners and even when we are headlining, it’s a 90-minute set. With a new record, it becomes increasingly hard to define what the set will be. How much of the new material can we put and what material people want to hear that they’re familiar from the classic albums. If it’s up to me, if someone told me tomorrow that all they want us to do is the entirety of the new album, that would be a lot of fun for me. We rehearse what rehearse as a band to make sure that our live performance is worthwhile. I love all the songs. There’s not any song on here that I would say, “I don’t want to play that.” I would play any of them. 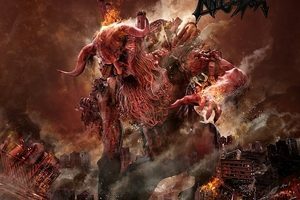 Blistering.com: How do you think “Radikult” or “Too Extreme!” will work, given that they’re “unconventional” Morbid Angel songs? Vincent: Well, “God of Emptiness” was an “unconventional” song when it first came out, and same with “Where the Slime Lives” and they have become our so-called “hits.” That’s our “Living After Midnight” or “Paranoid.” Trust me, when these things first came out, there was a lot of emotion around them. People were like, “Oh my goodness, what have they done? They sound different now!” It’s always happened to us. When Blessed Are the Sick came out and we had keyboards, people said, “Oh, they’re slow now.” People love when the glass is half-empty…our glass is never half-empty – it’s over-flowing. And it’s not Kool-Aid either. We do what we do. I’m used to this; it’s nothing new that people have diverse opinions of the band and I welcome it all. Positive, negative, in the middle…there hasn’t been much in the middle. It’s really interesting to me because it causes people to have a reaction. If things are just so easy that people mosey up to a McDonald’s drive-thru and they get their Happy Meal and it doesn’t taste any different than the last one, we don’t know. Are there more preservatives? Are the fries hot, cold, or soggy? Sometimes we don’t even make these distinctions. I promise you if you come down Tampa, Florida and to Bern’s Steakhouse, there are some distinctions to be made. It’s at a higher-level. There are some things that are very easy and there are some things that demand more consumer participation. I’d like that we fit amongst the latter. 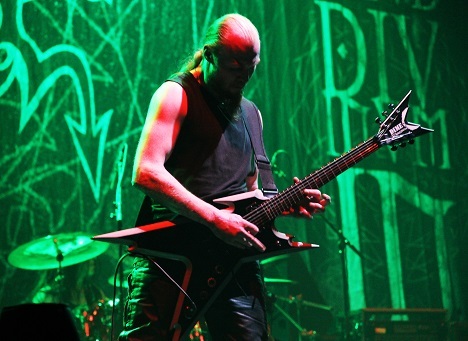 Blistering.com: You could make the argument that if people wanted traditional-sounding Morbid Angel, they could go back and listen to the Steve Tucker era. By what you just said, would you have been satisfied with the new album sounding like Gateways of Annihilation or Heretic? Vincent: Listen, I think there’s good material on all of the Morbid Angel albums. When we say “traditional-sounding” stuff, I would argue that there’s plenty of “traditional-sounding” stuff on Illud. Is that all there is? Is it predictable? I hope it’s not, other than it’s predictable in its unpredictability. I think we’ve broken ground throughout the years, so why should that change? Blistering.com: North America. What’s the plan? Is anything going to happen this fall? Vincent: There are a number of things being discussed right now, but I’m hesitant to talk about what it is. The stuff I’m looking at right now is not ready for primetime yet. We do have plans and when they materialize, I always suggest to people that they check with Morbidangel.com or one of our social media sites and when you read it there, that’s when it’s law. If you don’t read it there first and you read it somewhere else, then four-out-of-five-times, it’s rumor or someone’s opinion that has nothing to do with Morbid Angel.